Before the establishment of standard military awards, e.g., the Medal of Honor, it was common practice to have a medal specially created to provide national recognition for a significant military or naval victory or accomplishment. In the United States, Congress would enact a resolution asking the President to reward those responsible. The commanding officer would receive a gold medal and his officers silver medals. Other countries similarly honored their military and naval victors in a similar fashion. The custom of awarding the sequence of gold, silver, and bronze medals for the first three highest achievers dates from at least the 18th century, with the National Association of Amateur Athletes in the United States awarding such medals as early as 1884. This standard was adopted for Olympic competition at the 1904 Summer Olympics. 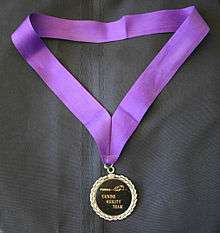 At the 1896 event, silver was awarded to winners and bronze to runners-up, while at 1904 other prizes were given, not medals. At the Ancient Olympic Games only one winner per event was crowned with kotinos, an olive wreath made of wild olive leaves from a sacred tree near the temple of Zeus at Olympia. Aristophanes in Plutus makes a remark why victorious athletes are crowned with wreath made of wild olive instead of gold. Herodotus describes a story that explains why there were only a few Greek men at the Battle of Thermopylae since "all other men were participating in the Olympic Games" and that the prize for the winner was "an olive-wreath". When Tigranes, an Armenian general learned this, he uttered to his leader: "Good heavens! what kind of men are these against whom you have brought us to fight? Men who do not compete for possessions, but for honour". Hence medals were not awarded at the ancient Olympic Games. At the 1896 Summer Olympics, winners received a silver medal and the second-place finisher received a bronze medal. In 1900, most winners received cups or trophies instead of medals. The next three Olympics (1904, 1908, 1912) awarded the winners solid gold medals, but the medals themselves were smaller. The use of gold rapidly declined with the onset of the First World War and also with the onset of the Second World War. The last series of Olympic medals to be made of solid gold were awarded at the 1912 Olympic Games in Stockholm, Sweden. The award of a gold medal, often coupled with the award of silver and bronze medals to the next place finishers, has been adopted in other competitive fields, such as music and writing, as well as some competitive games. Typically bronze medals are awarded only to third place, but in some contests there is some variety, such as International barbershop music contests where bronze medals are awarded for third, fourth, and fifth place. ↑ Melonyce McAfee (August 10, 2012). "Why Olympians bite their medals". CNN. Retrieved August 10, 2012. 1 2 Jennifer Rosenberg. "Interesting Olympic Facts". Retrieved December 12, 2013.